I have taken some time off from this blog and recovered from some disappointments to get myself back on track. Some of my faith in humanity has been restored (see the post here) so I’m feeling like venturing out of my cave again. Fall, with a good dose of Winter, has found it’s way back to North Carolina. My time is not spent picking and canning tomatoes now so I have returned to my office/studio. I had been beating myself up for spending a HUGE amount of time working on a drawing for the U.S. 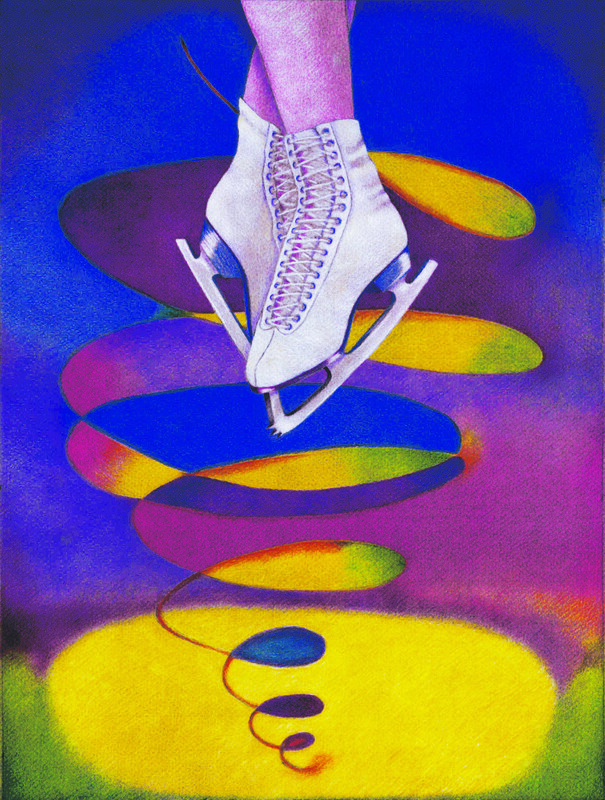 Figure Skating Championship poster contest that I was not accepted into. Here is the piece I submitted. I have a love/hate relationship with contests. I’m not a competitive person, but I like a good challenge. I don’t like the whole entry fee/waiting to hear thing and not really knowing what the judges are looking for. After years of being a designer and picking the brains of customers it is a very alien feeling to create something out of thin air without having any real direction. On the plus side, I had a great time playing with the colors in this poster. My scan isn’t as good as I had hoped (possibly one reason it wasn’t accepted) so the colors are not true here. Maybe somewhere down the line I will get it photographed for a print. I did learn to NOT try to do a large piece in colored pencil under a deadline. Way too much stress and finger cramps. I think it will be awhile before I enter another contest…like the 20 years since my last entry!